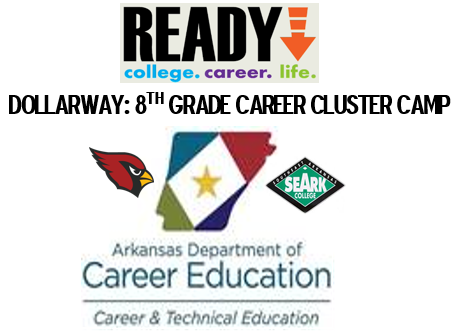 Robert Morehead Middle School (Dollarway) 8th grade students will have an opportunity to explore a variety of career clusters on SEARK’s campus during Dollarway’s Career Exploration Camp scheduled for Friday, April 5th, 2019. Career Exploration Camps are one-day learning experiences conducted at locations throughout the state in collaboration with the Arkansas Career Coach program. Campers will hear from professionals and will also participate in exciting hands-on activities and further explore their own personalized career guidance plans in areas such as: Health Science, Industrial Manufacturing, Human Services, Info Technology, and Health & Fitness. In the coming years, thousands of additional workers will be needed in Arkansas business & industry fields. Career Exploration Camps are designed to encourage students in Arkansas to prepare and pursue careers in those emerging fields. This event is open only to Dollarway 8th graders. The Career Exploration Camps are made possible through funding from the Arkansas Department of Career Education Division of Career and Technical Education and Arkansas Department of Workforce Services. For more information visit https://arcareereducation.org/... or contact Dollarway Career Coach, Mrs. Marla J. @ mbarnes@dollarwayschools.org.